Russia’s Army may soon have more money at its disposal, after an analysis of the military campaign in South Ossetia and Georgia. As the Vedomosti newspaper reports (Rus), Russia’s Ministry of Finance has delayed presenting the country’s financial plan through 2023, in connection with new requests from the security agencies for additional allocations. In the words of a Defense Ministry employee, the current budget requests were prepared before the war in South Ossetia, and now need to be amended. Combat has apparently shown some deficiencies in the Russian armed forces, with military officials saying their forces had inferior equipment to that used by Georgian troops. The military leadership also plans to equip Russian combat vehicles with night vision instruments, tactical communications equipment and reconnaissance assets, including unmanned drones. 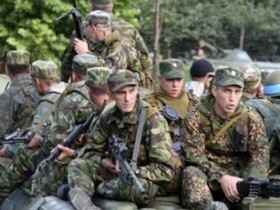 Reports said that 74 Russian soldiers lost their lives in the war, and 171 were injured. At a Wednesday briefing, Anatoly Nogovitsyn, the Deputy Head of the Russian General Staff, acknowledged that four Russian planes had been downed in the conflict. Calling this a serious problem, the Colonel-General said that the Georgian Air Defense, which was trained by Ukrainian specialists, posed a major threat to the Russian Air Force. Ukrainian experts were familiar with Russian technology, Nogovitsyn said, which hadn’t changed significantly since the days of the Soviet Union. Nogovitsyn also acknowledged the difficulty of air reconnaissance in smoky conditions, and the low efficiency of Russian electronic warfare, which similarly remained unchanged since the collapse of the USSR. According to Igor Korotchenko, a member Defense Ministry’s Public Council, outfitting Russia’s troops in the Caucasus with the proper equipment would cost at least 50 billion rubles.